This traditional Italian pasta from central Italy has a funny name that literally translates to "priest-chokers", probably because they are so good that they would choke a priest. this recipe utilises Japanese ingredients and French techniques for the sauce. 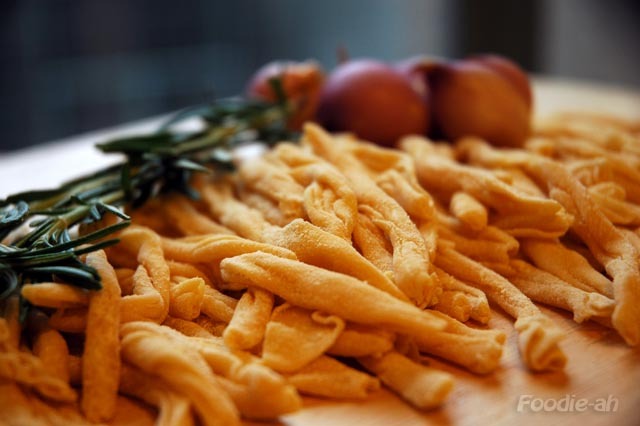 To make the strozzapreti for 2 people, mix 120gr plain flour, 30gr of semolina flour (optional, for texture, but you can alternatively use plain flour instead), a pinch of salt and a dash of olive oil. Kneed the dough until smooth, then wrap in cling film and let it rest for about 1 hour. Flatten chunks of dough through the pasta machine, and use the technique shown in this video to shape the strozzapreti. I prefer to cut the flat sheet into long strips and juggle it between my palms lengthwise making a long strand, and then cut it using my fingers at regular intervals. Also, I generally replace about 20% of the plain flour with semolina flour for texture. Cook some pork slices on a frying pan with a dash of olive oil and season with salt. I prefer to use shabu-shabu pork, which you can buy at any cold storage or Japanese food outlets. Remove the pork from the pan, then add the shallots and a whole branch of rosemary. Once the shallots start to get some color, deglaze with some Marsala wine or Port, then add about 5 cubes of meat stock (beef or chicken) and reduce to a half. Add a bunch of enoki mushrooms towards the end, cook for less than a minute then season with salt and pepper, remove the rosemary and remove from the fire. Separate the pork and mushrooms from the juice and set aside. To make the emulsion, separate an egg yolk and put it into a skillet together with 1/4 teaspoon of wine vinegar and a tablespoon of either olive oil or melted butter. When the water for the pasta reaches the boil, put the skillet in contact with the boiling water and with an electric whisk beat the egg until it starts to thicken. Add the reduced stock into the mixture and continue to whisk on the steaming water until you reach a foamy, bubbly, thick texture. Remove from the heat. Boil the strozzapreti and cook slightly longer than you would for normal pasta, to let the water penetrate (due to the fact that the pasta sheet is folded multiple times, they take longer to cook throughout). Drain the strozzapreti, put them on the frying pan on top of medium fire and stir to make them absorb the juice left at the bottom of the pan. 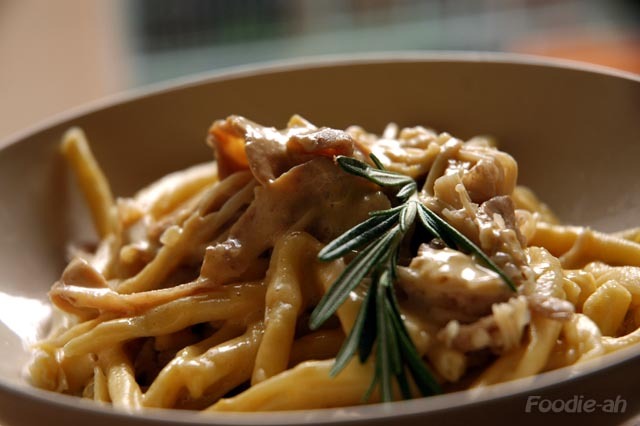 Arrange onto a plate with the pork and enoki mushrooms, then top with the emulsion and serve with optional Parmesan. This is great. Thanks for sharing the recipe. I think I might try it myself. Considering I'm a bachelor in Singapore, I need some variety. Great to hear that! Do watch the video for rolling the strozzapreti, it helps. Obviously you need the stock for making the sauce, but if you lack of that you can flavour it with more intensely flavoured ingredients such as bacon, for a quicker result.